The CleanSpace® Crawl Space Vapor Barrier is the heart and soul of the CleanSpace® system. This durable, bright white crawl space liner installs on the walls and floors, preventing water vapor and humidity from passing through. By keeping your crawl space dry, you protect your structure and insulation from mould and rot. With a 25-year warranty against rips and tears, this durable liner will convert your crawl space into a usable storage area. And with its mould-resistant additive "UltraFresh", CleanSpace® will never support mildew or mould growth on its surface. Along with protection from mould and rot, a dry crawl space will also be inhospitable to termites, cockroaches, ants, crickets, and many other pests that need excess moisture to survive. Mice and rats are deterred by the plastic vapor barrier, and flooding waters will be kept at bay. By sealing a crawl space, you also keep away odors and allergenic mould spores that would otherwise rise up through the floor and into your home due to the stack effect. 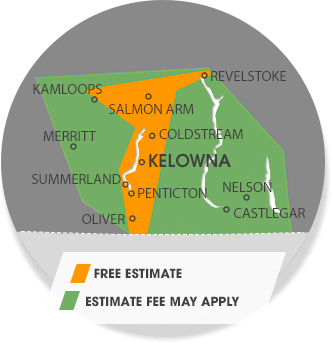 We service Vernon, Kamloops, Kelowna, Quesnel, Penticton, Williams Lake, Nelson, Salmon Arm, Castlegar, West Kelowna, Trail, Coldstream, Winfield, Westbank, Armstrong, Chase, Oyama and many nearby areas in British Columbia.